Koushan oversees the management of client projects in India and ASEAN for Dezan Shira’s Business Intelligence Unit, a division providing strategic solutions for foreign companies seeking to enter into or expand operations within India and ASEAN. He has assisted MNCs and SMEs with studies on market entry strategies, trade regulations, corporate establishment, industry analysis, opportunity studies, regulatory and compliance requirements. He also works on Dezan Shira's Vietnam Briefing subsidiary, focusing on providing analysis of industry regulations, compliance, and investment opportunities in the region. 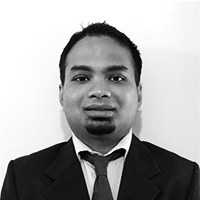 Previously, Koushan worked in trade and investment consulting, within research roles. He holds a MBA in Marketing and International Business from IILM, India and a BE degree in Computer Technology.